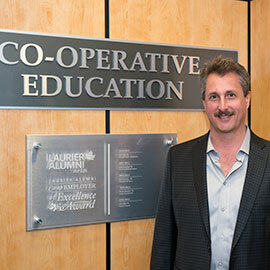 A Laurier graduate who has hired more than 137 co-op students is the recipient of Wilfrid Laurier University’s 2015 Alumni Co-op Employer Award of Excellence. Pete Gibel, senior vice president of merchandising for Staples Canada, received the award at a special ceremony on Laurier’s Waterloo campus Feb. 4. Gibel, who graduated from Laurier with a Bachelor of Business Administration in 1986, initiated the co-op program at Staples in 2004. In the past, Staples has employed students in merchandising, human resources, compensation, store operations and communications, as well as marketing. Students have been hired from across many of Laurier’s co-op programs, including business, arts and the MBA. The Alumni Co-op Employer Award of Excellence recognizes alumni who have been consistent, longstanding employers of Laurier students. Recipients provide a high degree of training and mentorship to co-op students and make outstanding contributions to Laurier’s co-op education program. The award is presented jointly by Laurier Co-op and the Development and Alumni Relations office. Numerous students, alumni and staff supported Gibel’s nomination. To nominate a graduate for the Alumni Co-op Employer Award of Excellence, contact Laurie Lahn, marketing and external relations coordinator, Co-operative Education, at llahn@wlu.ca.